Audio features include a mini-XLR input with phantom power for pro-style mics, a 3.5mm jack, and an internal stereo mic. Additional features include the same Blackmagic OS as the URSA Mini, and Bluetooth remote control. A license key for DaVinci Resolve Studio is included for versatile post-production control. The Pocket Cinema Camera 4K's carbon fiber composite build provides lightweight strength and durability, and power options include running off a Canon LP-E6 type battery or the included power supply. Adjustable in 1/3 stop increments. Maximum sensor frame rate dependent on resolution and codec selected. Storage rates based on 30 frames per second. 1920 x 1080 60 fps using full-sensor readout and 120 fps in windowed mode. Expansion port for optional external drive. Box Dimensions (LxWxH) 10.75 x 7.35 x 5.85"
Pocket Cinema Camera 4K is rated 4.4 out of 5 by 78. Rated 1 out of 5 by Kyle from Defective item on delivery I was very excited to receive my BMPCC4K. Camera was backordered a couple months but finally arrived. First test showed errors when playing back clips in ProRes. Also had a dead pixel that was being recorded to clips. Going to return camera for a replace one time. If the replacement has issues also im moving on to a different brand. Rated 5 out of 5 by Anonymous from No better image for the money This camera lacks many luxury features that YouTubers and Vloggers wish it had like IBIS, flip screen, EVF etc. But it wasn't made with them in mind. This camera is for filmmakers who want the best image for the best price. It costs a thousand dollars less than the GH-5s and comes with a full end-to-end editing/grading/audio/VFX software package. And most importantly the quality of the image it produces is far beyond anything any DSLR will give you. The fact that this camera is as good as it is for the price is just insane. Rated 2 out of 5 by Helene from Perfect IQ, unreliable, bad firmware, bad support The IQ, whatever mode you use, is great. Very cinematographic. The camera tends to be unreliable, can shutdown or reboot itself while recording. After a few weeks using it, I had a white screen issue, the camera was unusable, I sent it back to warranty. When the send it back to Mexico, they didnt declare for customs it as they should have. Now my camera is blocked in Mexican Customs, who want may to pay again the whole importation taxes I already paid (USD 370), and Blackmagic US support dont even answer me anymore!!!! Rated 2 out of 5 by Carlos from Defective Camera I was very excited to receive my BMPCC4K. Camera was backordered a couple months but finally arrived. First test showed errors when playing back clips in ProRes. B&H are the best they make so easy the exchange of the camera for a new one in the next batch. Let’s go to see what happen. I worried about the Blackmagic customer service they are the worst, seems like they are no prepare for massive production or demand. Like I said before B&H are the best the make everything more easy. Rated 5 out of 5 by Noah from Perfect camera (with a few flaws) I dont think theres much I can tell you about this camera that you couldnt learn from the million reviews that have been done about it. First let me say, besides my Alexa, I am deeply invested in the Blackmagic ecosystem. I believe that this company is always pushing for better tech at lower prices. I own four Ursa mini pros, And now I have purchased two of these cameras. I love them both! 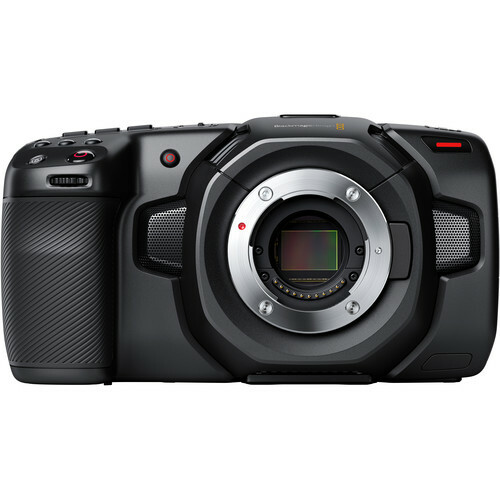 Pros: Amazing image quality, Blackmagic Raw, great low light , intuitive interface, bevy of different recording options in both format and cards. Cons: As many have said, You are going to need both power and monitoring solutions this thing chews their batteries and doesnt have a tiltable or rotatable screen. You will also need to purchase a speed booster to adapt to EF. This is not a deal breaker. Other than that, I LOVE THIS CAMERA! Just buy it! Rated 5 out of 5 by Dale from Nothing that compares for this price! So BMD has done it again. This camera puts true cinematic 4K capability in the hands of just about anyone. You cannot find a comparable camera with RAW and ProRes for this price and with in camera recording and multiple media choices! The mini XLR with phantom power really does make this a pro tool. The preamps seem fully sufficient to record studio quality audio directly into camera. The LPE6 battery will not be ideal for powering a fully rigged camera, but then fully rigged implies that you will have an alternate power source. The back screen is large and bright with touch screen capability. The BMD menu system is perhaps the best in the industry. I have configured this camera to work on the Zhiyun-Tech Crane Plus and the match seems ideal. The color science and quality of image in a camera at this price point is nothing short of OUTSTANDING. Rated 5 out of 5 by Karl from Best pictures and features for the dollar Amazing picture, color science, form factor, menu, and button layout. Improved battery life from the original. Battery life is still short - about 45-1 hour, but the USB-C charging / or SSD input is amazing. Camera is super light. Probably double the size of it's little brother but that allows for some amazing buttons on the screen and easy adjustments. The screen itself is HUGE and works 200% than the OG pocket. Seriously, not much not to love with this camera, especially for the price. Rated 5 out of 5 by Andres from Wow! The camera feels great; hefty yet not heavy. The body is inconspicuous like a DSLR. With the bigger screen, focusing and framing are easier. Tapping through the menu seems intuitive and responsive. My copy was pre-ordered on 9 April, shipped overnight, and delivered on 5 October. Paired with the Metabones SpeedBooster XL for Canon, the adapter has some play but not a whole lot. On the wider end of a Canon 16-35 IS f/4L, no vignetting was visible. The Arca Swiss foot on the Metabones is about a quarter inch higher from being flush with the bottom of the camera. The heat dissipated from the bottom vent was warm but my not hot. At the bottom, there are two guide holes for the proper alignment of accessories. The battery door does not give you solid feedback when closing; not an issue for me but noticeable. The included battery does not transmit percentage of power remaining and is not chargeable externally via the Canon LC-E6. The screen only showed a little decreasing battery icon. However, Canon and even Watson batteries give you percentage reading. This was an issue with the BMD battery as the camera shuts off without warning. In contrast, Canon or Watson batteries warn you at 20%, and are chargeable externally. Boot up takes between about 5 seconds. The power switch is a welcome change from the original BMPCC. ProRes LT 4K 60p DCI is possible to a SanDisk Extreme Pro V30 UHS I (rated for 95 MBps read, 30 MBps write speeds). I believe the camera has a buffer good enough for about 19 seconds and 30 frames. Please share what you find. macOS 10.14 does not mount SD or CFAST cards via USB C. Investing in a SD/CFAST 2.0 readers may be a must. Also, a MacBook Pro 15" did not charge the BMPCC 4K's battery via USB C but the Mac wall charger did. My BMPCC 4K is paired my with an ONA Bowery bag. It fits perfectly with accessories and one lens. This camera that it reminds me of 2008 and the Canon 5D Mark II; it changed everything. Can't wait to shoot more! Any huess on how well the BMPCC 4K will work with the Panasonic Leica 100-400mm and Ronin-S? Two things: 1. We feel there is a strong possibly that the lens will be too long to properly balance on the Ronin S and: 2. A 100-400mm is too long a lens for a stabilizer. The problem would be keeping the subject in frame unless they are a hundred feet away. Generally, stabilizers work the most effectively with wide lenses. A lens like the Panasonic Lumix G X Vario 12-35mm f/2.8 II ASPH. POWER O.I.S. Lens B&amp;H # PA123528A would be far more appropriate. Double tapping zooms in on that part of the image. In previous cameras, it zoomed in on the center of frame, but now it zooms to the part you tapped on. It does not focus for you. Does this camera have weather sealing? There is no special weather protection. The USBC port may be used to charge the internal battery when the camera is not recording. It will not power the camera separately. What is the noise like on the mini-XLR using, for example, a Rode or similar class boom (or any mic)? Is it comparable to DSLR or cameras it competes with? The Mini XLR cables should give you the same kind of performance you would get from cameras that have a 1/8&quot; input for a microphone or standard XLR connections. The quality of the microphone used will determine how it sounds more than anything else. Is Samsung Portable SSD T5 external fast enough to record 12 bit RAW 4K? Yes, up to 30 fps. Can anyone tell my the crop factor of this camera? I saw it was 1.9x but it can get up to 4x in 1080? When using an EF adapter, the crop factor (when compared to full frame 35mm 16:9) when shooting in 4096x2160 is 1.9, when shooting in 3840x2160 it's 2.0, and in 1920x1080 it's 4.0. Whats the best adapter for Canon EF lenses and how does the autofocus work? I cannot recommend adapters. Auto focus is a single focus not continuous. You may tap the viewfinder at the area you want to focus.